I really like BOOM! Studios. Consistency seems to be becoming less of a trait with publishers in today’s market. But BOOM! 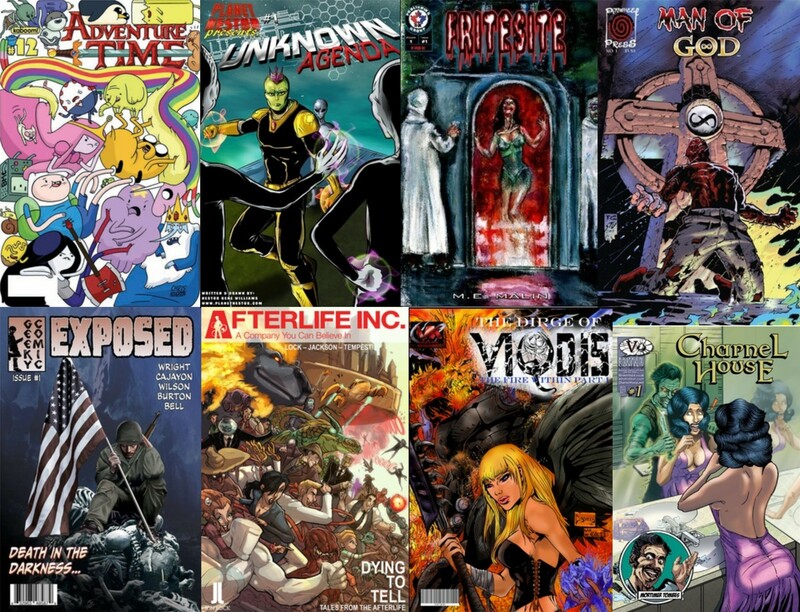 continues to produce quality books every month, with no massive shifts in the feel of their books. Quality is the word, and Escape From New York carries on that legacy. Picking up from the last issue, Snake Plissken has arrived in Florida. Home to the notorious Twins, teen tyrants that have the state locked down and guarded with nuclear missiles salvaged from the Cuban Missile Crisis. Now obviously, I don’t want to give away too much here, partly because so much goes on in this issue, and partly because my favourite moments in this book that you seriously should just read. Plain and simple, there’s smart stuff going on here. Christopher Sebela has really got the mentality here. In fact, if I didn’t know better, I’d say it was just a Nome De Plume for John Carpenter. It looks like Carpenter, it sounds like Carpenter, it has the mentality of Carpenter. One of the aspects John Carpenter introduced into his films and stories is often over-looked, Carpenter’s stories were frequently smarter than they initially seemed. They Live for example, was an indictment on consumerism and public control. And Escape From New York was no different. Much like First Blood, the original Rambo film. Around this period, there were a number of films that offered or implied a comment on the way Military veterans were treated after they had returned from the Vietnam War (keep in mind these films were made less than a decade after its conclusion). Snake is an example of disillusionment with his country, watching it go to Hell and dealing with the aftermath. Frankly, we don’t know if Snake is clear about what he wants from life now, other than to go where he wants. And, if nothing else, what he doesn’t want to do. All of these themes are ever-present in Sebela’s script, when Snake speaks, I’m hearing Kurt Russell at his grim and grittiest. I’m even hearing the pace, ideolect, and the sneers. Sebela also continues to drop the “in-jokes” appropriate to the original film and it’s period. I’m particularly glad he avoided the trap of over-using the “I heard you were dead” line, reserved only for the first issue. Diego Barreto continues to deliver on the art, aside from the feeling that he needs to improve on action scenes. I can’t fault the story-telling aspects in this issue. It flows well from the first to the last panel, and although I’d probably like some scenes to be slightly more extended, it makes it’s mark and delivers what we need it to portray. 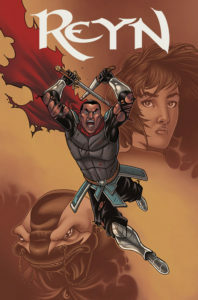 Given the constraints of capturing it all in 22 pages, I’d say Barreto is getting a feel for what this book needs now. His work has really begun to grow on me. So far, we’re only half-way through this series and the pace is perfect, full of wonderfully inventive situations, even the script is deliberately corny. Christopher Sebela has gone for authenticity throughout, yet it doesn’t feel like he’s trying too hard. It’s just the perfect transition so far, And I can’t help feeling that we’re finally getting the sequel the original film deserved. 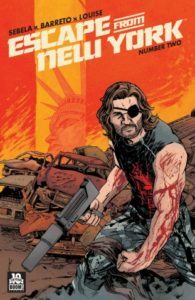 Summary: Between the escalation of World War III and being Number One on America’s most wanted list, Snake Plissken jumps borders and finds himself in the seceded nation of Florida. While he may have escaped the USPF, Snake finds himself in the middle of a whole new level of political corruption. Summary: Reyn is a freelance swordsman and monster hunter who also might be the last of the legendary “Wardens” of the land of Fate, whose ranks long since faded into myth. He’s haunted and driven by visions from a “guiding angel” who sets him on the path of a great quest— though Reyn’s hardly the errant knight-type. He’ll rescue and partner with the sorceress Seph, a member of a coven known as the Followers of Tek, hunted as heretics for their beliefs, but who may know what secrets Fate holds. I’m not gonna lie, I’m a sucker for a good Dungeons & Dragons styled story, and this one is off to a hell of a good start too. From this first issue you get a really good sense of the world they live in and what it means for the land to have this Reyn; who is a knight of sorts. Or a ‘Warden’ as they are called, who is also a good guy and as well as a good fighter who prays to the Goddess of Light. Okay he’s good, interesting so far and he’s skilled, and if Nate is going to keep delivering creatures like the spider-thing he fought then, oh yeah I can’t wait to see more. One question though is Reyn intended to be a man of colour? He’s got the colouring on the page that makes him darker than the others but his facial features and such send mixed signals so I can’t place what kind of ethnicity he’s supposed to have. Mind you it doesn’t matter but it’s a tad confusing. I did however like how the family tried to help Reyn make up his mind of sticking around the area. Not quite original but definitely the way a joke goes, and well it was kind of cute. I can see after what happened how they’d want him to stay, though his journey isn’t over as it’s just beginning. So naturally he’s not staying, though I have to wonder if he went through with it. Ledwain is a place Reyn went into on his journey, and it’s here where we meet the next player in this little drama as well as some very interesting villains. I can’t help but feel it’s pretty standard fare when it comes to this kind of story; you’ve got your hero, he meets some traveling companions, and they band together to save the world kind of thing. But so far what’s really catching my attention and making me excited for this series is the artwork. It’s fresh, original, and yet completely familiar to my eye and that makes this more fun. Although because one particular figure is covered in a hood and jacket, I can’t tell what species it is. But he’s got black, gray, and purple in his face and it’s reptilian but totally intriguing. And I really look forward to seeing more of this figure. When we meet Seph, she’s in the Square being branded a heretic and chases off after Reyn. Turns out she’s a follower of Tek, a healer, and she possess the skills and abilities of a cleric. Well one who can fight or defend herself as the case may be. Makes me miss playing my Elf Cleric campaign where she really was a badass powerful character. While this is happening, the purple guy is heading to an area to introduce us to the big bad of the area. Salamanders it seems to me, and I like that it’s a different kind of species villain so kudos. It also appears that the leader had extinguished the light of the Wardens two millennia ago, so yeah we’re definitely in for an interesting story here. Seph’s big fight scene is pretty cool, and the effects of her magic on the page really makes it pop and gives you the feeling of just how powerful she really is. When she meets up with Reyn he’s either talking to himself or a ghost, take your pic. And seems pretty much off his rocker as well. Okay there’s an aspect I wasn’t expecting, and well this should lead directly into the next issue. It also adds something that was missing to the mix and puts the uniqueness stamp on things. While this seems pretty standard fare as the book progresses, it takes on it’s own unique flavour and becomes a stand out on the merits of it’s creators. This is a very pleasant surprise and should be in your reading pile!